Do you want to start a WordPress blog the right way? We know that starting a blog can be a terrifying thought specially when you are not geeky. Guess what – you are not alone. 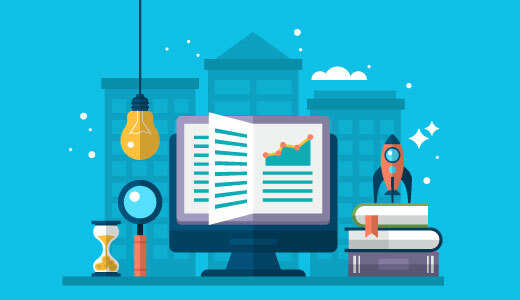 Having helped over 130,000+ users create a blog, we have decided to create the most comprehensive guide on how to start a WordPress blog without any technical knowledge. The biggest mistake beginners make when building a blog is choosing the wrong blogging platform. Thankfully you’re here, so you won’t be making that mistake. On top of all this, Bluehost has been working with WordPress since 2005, and they are committed to giving back. That’s why they have promised us that if you cannot get your blog online within 30 minutes by following this tutorial, then our expert team will complete the process for you without any cost. They will compensate us, so you don’t have to. Contact us for free blog setup help. NOTE: At WPBeginner we believe in transparency. 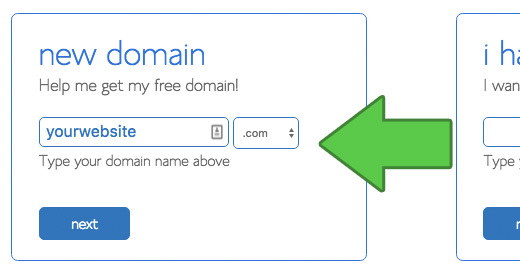 If you sign up with Bluehost using our referral link, we will earn a small commission at no extra cost to you (in fact, you will save money and get a free domain). We would get this commission for recommending just about any WordPress hosting company, but we only recommend products that we use personally use and believe will add value to our readers. On the next screen, you will able to search from 5600+ free WordPress themes that are available in the official WordPress.org themes directory. You can sort by popular, latest, featured, as well as other feature filters (i.e industry, layout, etc). You can take your mouse over to a theme and you will see a Preview button. 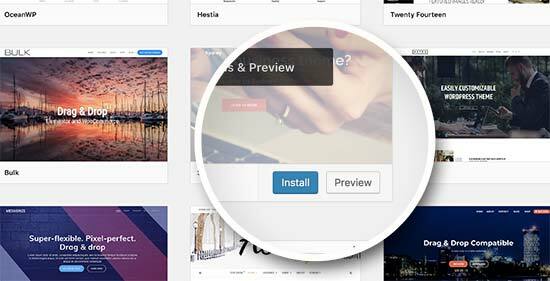 Clicking on will open the theme preview where you can see how it would look on your website. The preview of your theme may not look exactly as shown in the screenshot, which is normal as you will get to customize and set it up later. What you need to look for is design, colors, typography, and other elements. The best tip to select the perfect WordPress theme is to strive for simplicity in design. It helps you keep things clean and clear while offering a good experience to your users. If you need help selecting a theme, then please refer to our guide on 9 things you should consider when selecting a perfect WordPress theme. On the posts screen, you will notice several other sections such as Categories and Tags. You can use these to organize your blog posts. We have a great writeup on the difference between categories vs tags, which we highly recommend that you read. To utilize all the features on the posts screen, you should read our article on how to add a new post in WordPress (video included). 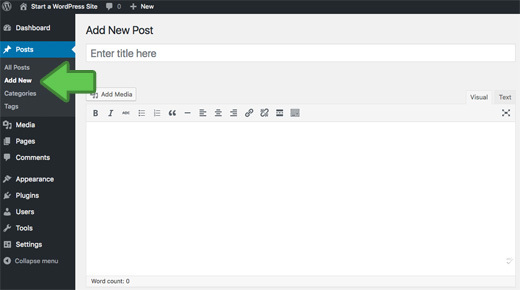 Often beginners are confused between posts and pages menu in the WordPress dashboard. That’s why we have written a complete guide on the difference between posts vs pages in WordPress. Once you have written your first blog post, you probably want to get started with adding other usual elements on your website such as contact forms, galleries, sliders, etc. To add all these additional features, you need to use plugins. There are over 55,000 WordPress plugins available in the free WordPress plugin directory alone. This means no matter what you want to accomplish, there is a plugin for it. 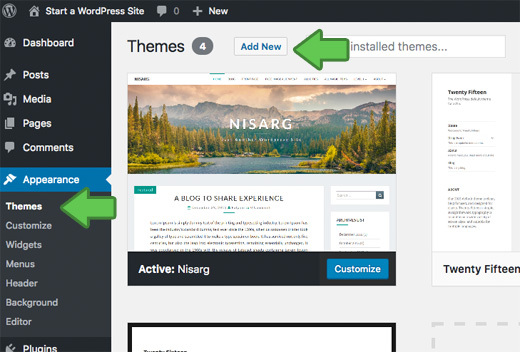 We have a step by step guide on how to install a WordPress plugin. That being said, let’s take a look at how to use plugins to add some essential features to your WordPress blog. Every website needs a contact form. It allows your users to contact you directly. 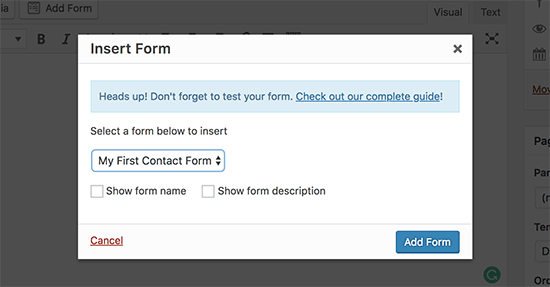 Since WordPress doesn’t come with a built-in contact form, you will need a WordPress form builder plugin to add a contact form on your site. We recommend using the WPForms Lite plugin. It is free version of the popular WPForms plugin, which is #1 in our list of best contact form plugins for WordPress. You can install the plugin by going to Plugins » Add New page and typing WPForms in the search box. Next, you need to click “Install” and then “Activate”. 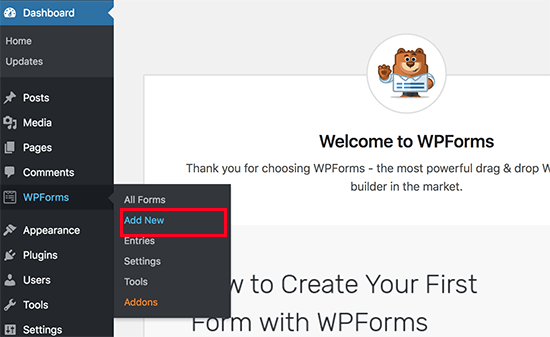 Upon activation, you need to head over to WPForms » Add New page to create your first form. This will open the WPForms builder interface. First, you need to enter a name for your contact form and then click on ‘Simple Contact Form’ template. 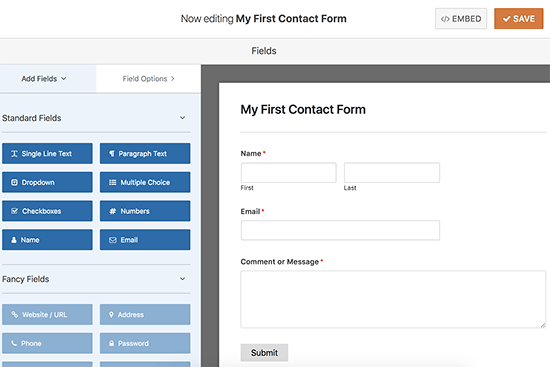 WPForms will now create a simple contact form for you with all the required fields. You can click on any field to change it, or add a new field from the left column. Once you are done editing the form, click on the save button at the top right corner and then exit the form builder. 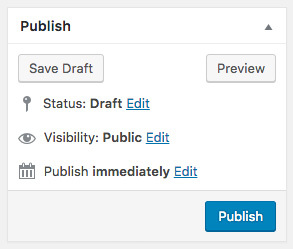 You can now create a new page in WordPress by going to Pages » Add New and call it ‘Contact’. On the edit screen, you will notice a new ‘Add Form’ button. When you click on it, it will bring up a popup where you need to select the form you created earlier and then click on the add form button. WPForms will now add the form shortcode into your page. You can now save and publish the page and visit it in your browser to see your contact form in action. 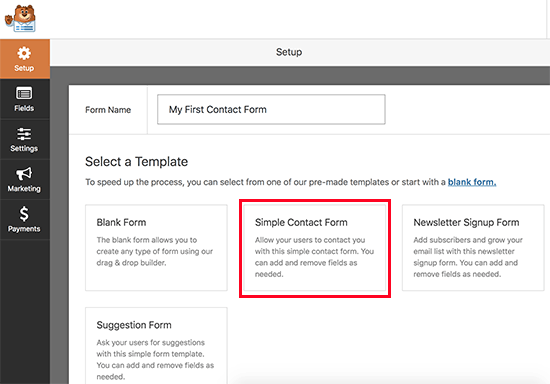 If you need more detailed instructions, then see our step by step guide on how to create a contact form in WordPress. Google Analytics helps you see how many people are visiting your blog, where they are coming from, and what are they doing on your website? It is best to install Google Analytics when starting your blog, so you can see how much your blog has grown over time. First, you need to visit Google Analytics website and sign in using your Gmail account. Once you are logged in, you can go ahead and sign up for a free Google Analytics account. You will be asked to provide your information and website URL. After that, you will be presented with your Google Analytics tracking code. You can stop here because we will be using a plugin to automatically fetch and add this code to your blog. 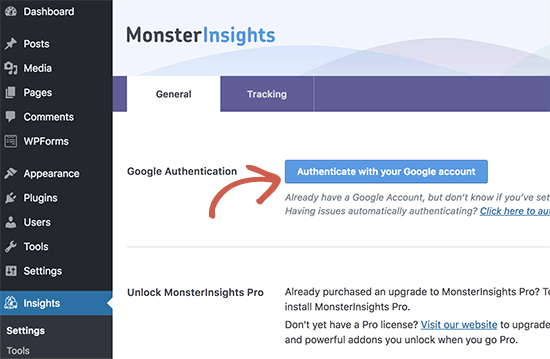 Switch to your WordPress admin area to install and activate the MonsterInsights plugin. It is the free version of the best Google Analytics plugin for WordPress, and it is the easiest way to add Google Analytics on your site. 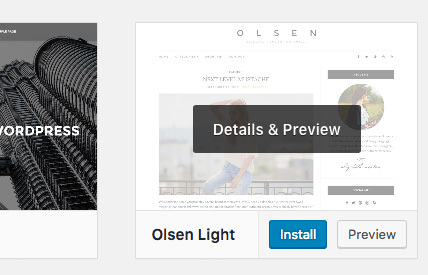 Upon activation, you need to visit Insights » Settings page to configure the plugin settings. On the settings page, click on the ‘Authenticate with your Google account’ button to connect Google Analytics to your WordPress site. Follow the onscreen instructions to complete the setup. 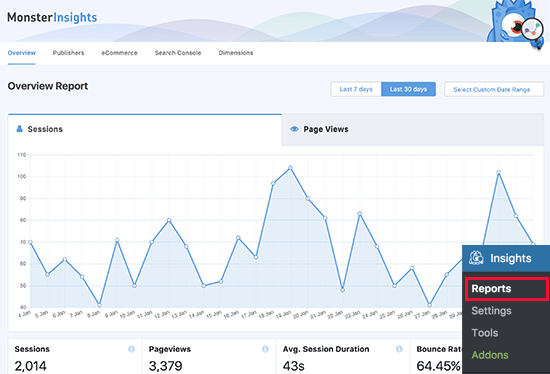 Once done, you will be able to see your website analytics report straight from your WordPress dashboard under the MonsterInsights tab. For detailed instructions, see our article on how to install Google Analytics in WordPress. Most beginners don’t optimize for SEO when creating a blog. SEO or search engine optimization helps users find your blog in search engines. If you want more traffic, then it’s crucial that you optimize your blog for SEO from the beginning. To get started, first you need to install and activate the Yoast SEO plugin. It is the complete WordPress SEO plugin that will help you optimize your blog. Upon activation, you will see a new menu item labeled ‘SEO’. Clicking on it will take you to the plugins settings page. The plugin comes with a quick configuration wizard to help you walk through the set up. 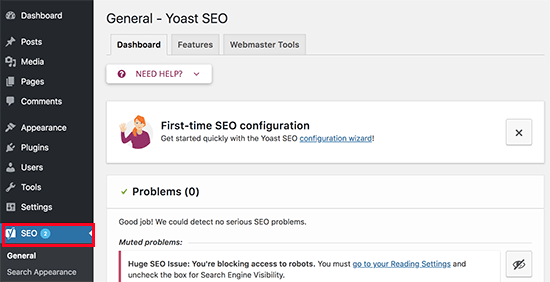 You can also follow the instructions in our Yoast SEO guide for manual set up. We also recommend you to follow our complete step by step WordPress SEO guide to set up your blog’s SEO. There are a ton of others WordPress plugins that you can install. Often beginners find it a bit overwhelming to search for the plugins they need. At WPBeginner, we often feature the best WordPress plugins to help you add the functionality that you need. Here is our expert pick of the best WordPress plugins that you should check out. Backup – UpdraftPlus is the best WordPress backup plugin. You need to create regular backups of your website in case something ever goes wrong. Security – Sucuri Security is a free security scanner for WordPress. We have a complete step by step WordPress security guide for beginners that will help you secure your blog. Performance – We recommend using WP Super Cache to speed up WordPress. For more on this topic see our article on WordPress speed and performance with step by step instructions. If you are curious about the plugins and tools we use on our site, then check out WPBeginner’s Blueprint. It has all the plugins and tools that we use on the WPBeginner blog. Need more recommendations? See our expert-pick of the must have WordPress plugins and tools for business websites. Now that you’ve created your blog and customized it to your liking, you are probably wondering how can I actually make money from my blog? There are actually a lot different ways to successfully monetize your blog. However there is no such thing as a get rich quick scheme. Unlike other “make money online” articles, we have created the most comprehensive guide on how to make money from your blog using WordPress. That’s a 4000+ word guide that everyone who want to make money with their blog needs to read. We have shared our 14+ years of online wisdom in that ultimate guide. As long as you’re willing to put in the hard work and effort, you’ll reap the reward. Remember, there are no shortcuts. 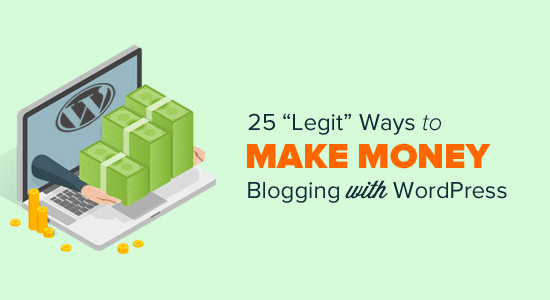 Here are some of the best ways to make money from your blog. Many bloggers make money by showing ads on their blog. If you make a blog with monetization in mind, then Google AdSense is the best way to do this. It is the largest advertising platform for bloggers and publishers. 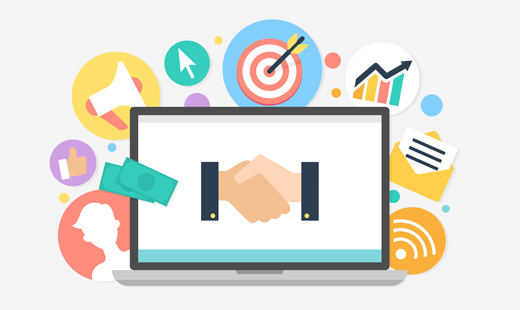 Acting as a middleman between you and the advertiser, Google allow advertisers to bid for keywords matching your content. This allows you to get the best rates possible for the ads. For more details, see our article on how to properly add Google AdSense to your WordPress blog. Affiliate marketing is the second most commonly used monetization strategy among bloggers. Basically, you recommend products and services to your readers and when they make a purchase you get a referral commission. The key in affiliate marketing is to recommend high-quality products and services that you already use and trust. There are plenty of affiliate marketing plugins and tools for WordPress that can help you make more money when promoting affiliate products. We have a complete step by step affiliate marketing guide for beginners, that will help you get started. Many bloggers make money by selling things directly from their blog. This could be physical products, digital downloads like ebooks, artwork, music, and more. Some bloggers even offer consulting services. We recommend using WooCommerce because it is the best eCommerce plugin for WordPress. It also the most commonly used eCommerce platforms in the world. 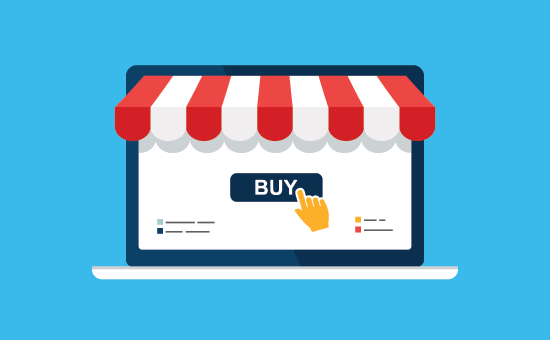 For detailed instructions, see our guide on how to easily create an online store using WordPress. That’s not all you can do with your WordPress blog. You can make WordPress blogs specifically for reviews, fashion blogging, food blogging with recipes, and more. Each of these blog types brings you more unique opportunities to make money. WPBeginner is the largest free WordPress resource site for beginners. At WPBeginner, our main goal is to provide cutting-edge helpful WordPress tutorials that are easy to understand for small businesses, bloggers, and non-techy WordPress website owners (see more about us). WPBeginner Videos – New to WordPress? Watch these 23 videos to master WordPress. WPBeginner Blog – The central place for all our WordPress tutorials. You can also subscribe to WPBeginner’s YouTube Channel where we regularly share video tutorials to help you learn WordPress. Lastly, you can use Google to type your question and add WPBeginner in front of it. Our users find this very helpful because you’ll likely find an answer to any WordPress questions that you have. In case you don’t find an answer to your question, simply use our contact form to send us a message. We love helping users get started with WordPress. Having helped thousands of people start a blog, we have answered quite a lot of questions. Below are the answers to the most frequently asked questions about creating a blog. Yes, there are several other blogging platforms available. We have compared them all, and WordPress is by far the best solution in the market to make a blog with complete ownership and freedom. Can I build a blog without hosting? No, that’s not possible. Web hosting is where your website files are stored. All websites need web hosting. The cost depends on the add-ons that you buy. We have a complete guide on how much does a WordPress website cost as well as tips on how to save money. Can I create a blog without my parents knowing about it? Yes. You can make your WordPress blog private and hide it from the internet. Here is a step by step guide on how to make your WordPress blog completely private. 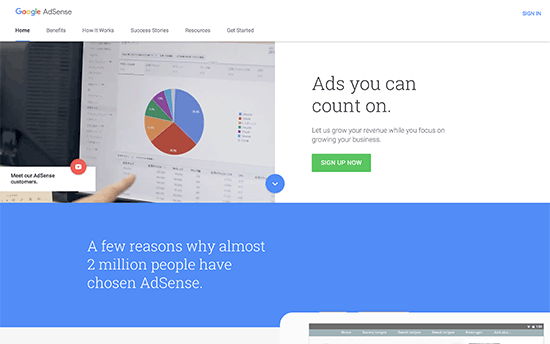 Can I start a WordPress blog and make money with Google Adsense? Yes, you can use your WordPress blog to earn money from Google AdSense. We have a step by step guide on how to add Google AdSense in WordPress. How can I create a blog and remain anonymous? If you want to have a public-facing blog but want to remain anonymous, then you need to make sure that your domain has WHOIS privacy turned on. Often people use a pseudonym / nickname to write under. You should also create a unique email just for your blog. It goes without saying, don’t post your pictures or anything on the blog. For more detailed instructions, see our article on how to blog anonymously using WordPress. How do I add a podcast to my WordPress blog? WordPress makes it super easy to start a blog and add a podcast to it. We have a step by step guide on how to start a podcast with WordPress. How do I come up with blogging ideas to write about? Here’s an excellent guide that has 103 blog post ideas that you can write about today. Here’s another guide on 73 types of blog posts that are proven to work. Can I build a blog in my own language? Yes, you can use WordPress in other languages. You can select your language during installation or from Settings page in WordPress admin area. WordPress is fully translated in more than 56 languages and partially translated into dozens of other languages. Many top WordPress themes and plugins are also available in multiple languages. You can also translate a theme or a plugin that you want to use on your website. How do I create a blog in multiple languages? Want to start a blog in Hindi, Spanish, or multiple languages? Here’s a step by step guide on how to create a multilingual website in WordPress. 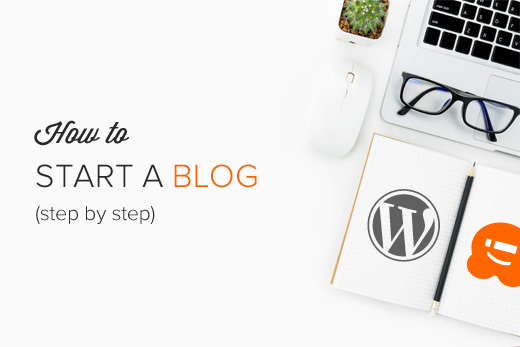 We hope that you found our tutorial on how to start a WordPress blog to be helpful. You may also want to check out our article on 19 actionable tips to drive traffic to your new WordPress site. your article is really helpful and you cleared many concepts regarding themes and plug-ins. I am WP beginner and article will help me to build my website good. i wanna develop a website just like you! what wordpress theme do i pick to make a website like you? Our theme was one we created custom for our site, we do not have a recommended theme to duplicate the design at the moment. Thank u so much for sharing these things. I really wanted to learn all about these and it is so easy to understand. Again, thank you so much for the detailed and step by step process. I wanted to become a very good freelancer in the future and this would be my great guide for a beginner like me. Hello i wanna create my own blog site should i use wordpress.com or use it with my own host ? Hi, I have hosting of siteground which has the option of creating multiple websites. I already have one website. How do i create another one on the same hosting? this a great place to learn everything from building your blog to sustaining it. I’m sure in few weeks from now, I will start building my own blog by myself. very very useful article. It would help me a lot. I am looking to set up a blog to report on current court cases. I have set up a facebook page and I know my friends can see it, but i’m not sure if others can see it. It appears my privacy settings are open. I would like to set up blog. What I want to do is charge a small fee to join and follow my blog. Is that possible? I know the newspapers do it. Being the methodical type, I studied all the information to which you linked me in your emails since the beginning of this week – “to get all my ducks in row”, so to speak. At least in theory, now I now longer feel like the WP Beginner I truly am, but like a WP Expert. The breadth of information you provide is mind-boggling and goes surely far beyond the mere Beginner stage. At least – that’s the impression I gained after having studied “Beginners'”-tips on WP for almost a week before subscribing to WPBeginner, and which was so elementary and uninspiring that I doubted it would be worth my while to switch from DotNetNuke to WP. Now at last I’m all set to start building my WP site. If you reach out to the hosting provider, they should be able to let you know the other options they have available. I have one question. Please give me answer. After submitting articles in article submission websites in off-page seo how I will create link. After Publish option what i will do. Please answer me briefly. If you’re submitting your articles to another site, you would want to reach out to that site for their available options in terms of SEO. How can I do this if I already have a wordpress.com blog? Without Any Views on My Blog, Can I Get Money Just Posting Ads On it. You would need traffic on your site to start generating money from it. Someone created the website for me.. I found the video SO helpful, honestly am very grateful to have resources such as this! made my website easily within minutes also using bluehost for my domain etc. – and i am not tech savvy at all! thank you! I want to start my blog, have some doubts, however, I want to know how long does it take until I can start earning decent money from my blogs? There are too many variables to give a definitive date for how long it takes to earn what you would consider decent money with a blog. But that didn’t happen for me. It went straight to the “create your password” page and when I did, it took me to a page to pick a Bluehost theme. I didn’t even get to install WordPress! 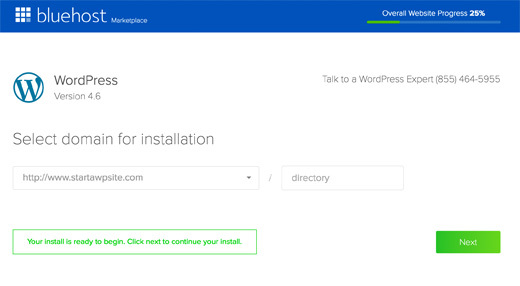 From the sound of it, you likely are using the new BlueHost auto installer. BlueHost should have handled the steps involved in installing the site for you and you should have a link to log into WordPress from your BlueHost control pannel. Should we monetize the blog from starting itself or wait for the traffic first? That would be a question based on your personal preference. I have a question about hosting. I am planning to start a blog that I wish, over time, would have e-commerce store. I read about Bluehost that its not very good, or any from EIG. Which host do You reccomend for Europe (Croatia)? I want to know that can I pay hi hosting charges monthly or I have to pay lump sum amount together. It would depend on the hosting provider, if you reach out to the host they should let you know. OMG, I am launching an anonymous activist blog with WP and my brain hurts! And I thought I was pretty good with technology but I have to admit that it’s a bit overwhelming when you start working on it. Thank you for this amazing tutorial. Being new at WP, and pondering over its setup for the last 2 weeks, it made me feel like a pro. If I use bluehost as my host and install word press on it, does that mean I also have to pay WordPress for their premium account? Does that make sense? I’m trying to figure out how much the total start up cost will be. If I go with the paid version of WordPress and bluehost, does that mean I am paying both of them? Please i submitted my site to google ads but was’nt approved. now am asked to enroll in SEO. Please can you tel me more about the SEO and what the charges? This is confusing. Are we supposed to use Bluehost or Hostgator? The lack of correlation between the text, and the tutorial make it difficult to follow, and creates uncertainty in the minds of your users. Your domain name suggests that this information is for beginners. There are enough questions revolving around the process of setting up a blog or website as it is. I can’t help but notice that this article was last updated almost 3 weeks ago. Is there any plan to upload a new tutorial to match the information in the text, and if so, when? Help! I got to theme part and none of the themes show up- they look awful like in a weird format- why is this happening? this site did not successfully guide me thru setting up hosting thru bluehost and domain with wordpress.org. i spent 3 to 4 hours over 2 days attempting to figure out the steps set out in this post. i ended up refunding my bluehost payment because i am not tech savvy and felt completely lost. in the end it cost me approximately $12 and loss of confidence with technology thank you for the attempt, it read great and it gave me the confidence to try, but in the end failure. Perfect knowledge i was searching from days about how to start a wordpress blog. Thank you wpbeginner team for guiding new bloggers. I am planning to launch a new website and want to know what is the cheapest and best web hosting service per year? Currently I am using Hostgator. Also suggest the best WordPress security plugins. Thanks for these valuepacked tutorials. They are of great help. Kudos. Is the hosting site with the discount Gator or Bluehost? The video tutorial uses Gator as the example so a little confusing. First I want to say thank you for this tutorial, very informative! I noticed in the video you’re using hostgator, but the blog suggests bluehost. Is there much of a difference between the two and do you have a promo for both? 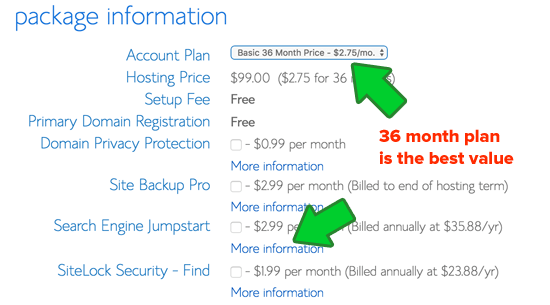 Also, with the hosting being charged monthly, in hostgator it looks like you can just pay by month, but bluehost it looks like you have to pay upfront the full amount for however many months you want, is this accurate that you pay for all the months up front? Would like to know how to budget this before pressing okay and having a surprise. This post is pretty educative. I recommend it to you if you want to build a WordPress website/blog. I need one or two recommendations (other than SiteGround since it’s a bit expensive for me) regarding choosing an EU based and wordpress full-featured web hosting. I keep reading that Amsterdam has the best internet in EU and I’m residing in the Netherlands. Thanks for your attention already. Note: Asking here, since the shoutbox under “How to Choose the Best WordPress Hosting in 2019 (Compared)” doesn’t exist. For the moment we do not have geographic based hosting recommendations other than our recommended hosts on that page. This is so comprehensive, yet not overwhelmingly so. Thank you! I bought two domains from GoDaddy last year but am only using the .com one at the moment. There are several things about the GoDaddy setup which are limiting my ambitions with the type of site I am looking to create so I have decided to set up a WordPress site using my .co.uk domain which is currently idle. I would be grateful if you could provide information about how to transfer a domain which I already own across to Bluehost. Thanks for the informative guide about setting up a wordpress blog. Each host has their own method for transferring a domain to them. If you reach out to the host they should let you know if they can have that type of a domain and the method to transfer it. Hello, I’m working with a non-profit with a wp.com free website who would like to use Google Analytics with as little cost to them as possible – so can double-triple check from what im reading in various places (it seemed like some people with free blogs have GA) that using GA is only possible for Business accounts of $20 per month? And that no GA is available in any other possible way cheaper way either on .com or .org? Thanks in advance! For WordPress.com sites, WordPress.com has a monetize page for the other monetization options you have available on WordPress.com. 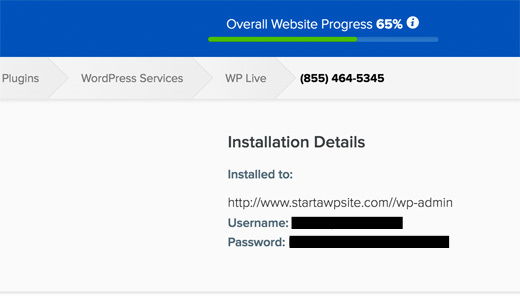 I was able to purchase hosting through BlueHost but can’t find anything called “cPanel”, or a page that looks like the one you show under “Step 2: Install WordPress”. So I never did any of that, and yet it seems as though I’m able to use WordPress theme and such. Is this an automatic thing now, or did I miss a step somewhere? 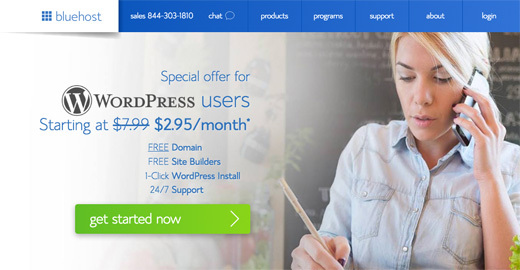 You may have one of the WordPress specific plans, BlueHost has some plans that they have a setup wizard for WordPress when you first log in to your hosting account. That is likely why you are able to log in and you shouldn’t worry about installing WordPress again. Take a look at our tips to grow your business online you will find many ideas to bring more traffic. This post is really helpful.Can I make blog site with free theme & plugins?